We sell upholstery foam cut to size and standard-stock upholstery foam sheets (custom cut available) in a range of qualities and firmnesses. All the upholstery foam sold on this page is certified flame retardant free, except Rebond. If you require flame retardant upholstery foam visit our F.R. Foam page. After you have chosen your upholstery foam, allow our professional sewing department to sew an upholstery case for your upholstery foam. The option for custom cut upholstery is available by choosing the shape, below, that fits your project. Upholstery foam layers can be combined to make a very cozy cushion. 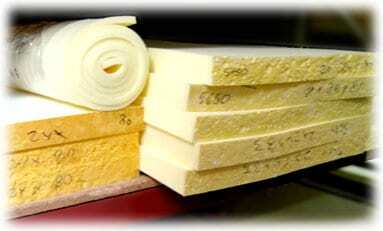 For example, if you need 6" of upholstery foam, order 3" of memory foam and 3" of our V34 grade upholstery foam. 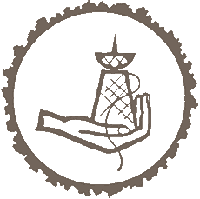 This will make a luxuriously soft cushion that won't bottom out beneath the seated weight of a 175-pound person. We can custom cut this for you! All dimensions will be rounded to the nearest 1/8 inch (approximately 3 mm). Choose from 15 different densities. Enter the thickness for a price quote. Thickness should be between 3/8" and 30" (1–76 cm). The price quote page will show the sheet widths and lengths that are available, the types of foam you can order, and prices for each. Attention upholsterers and workrooms, get about 50% off when you set up a wholesale account! Need Upholstery Supplies and Tools? Visit our sister site for upholstery supplies, upholstery tools, or a button machine. Get 75 pages of FREE upholstery instruction with every purchase. How long will my Upholstery Foam last? You really get what you pay for with upholstery foam. The more expensive the upholstery foam / upholstery foam sheets, the longer the upholstery foam / upholstery foam sheets will last. You don't need high quality upholstery foam for a seating area that doesn't get used, while a sofa for watching "the game" will need top quality upholstery foams. Our experience has shown us that most upholstery foams / upholstery foam sheets will break in and soften up to about 20% over time—if under heavy use, after 6 months to 1 year. Despite this warning we still don't recommend that you order the next firmer upholstery foam grade. If your upholstery foam is too firm, you may never sit in it and the upholstery foam / upholstery foam sheets may never soften. One way to construct a really long lasting upholstery foam cushion is to use our rebond upholstery foam. This grade of upholstery foam (rebond upholstery foam) has proven not to soften with time. Rebond upholstery foam has three times the quality and weight of other upholstery foams. You may need to make the bottom half of the upholstery foam cushions out of rebond foam and the top half out of softer upholstery foam to create the perfect comfort. In these circumstances, wrap the entire upholstery foam cushion in our polyester upholstery foam batting. Because we do our own upholstery (custom cut upholstery, or just plain old upholstery), we have become a one-stop custom cut cushion paradise. Our professional upholstery can make any custom cut cushion look amazing. Catering to your needs, we can make custom cut upholstery to fit your desires, including custom sewn upholstery foam, or just provide special upholstery foam in order for you to do your upholstery on your own. Upholstery here comes in a variety of options. You could even send us your own upholstery fabric and have us custom cut and sew it into a professional looking upholstery job. To send us your own fabric, see our custom sewing section. We offer upholstery and also run an upholstery supply store—Rostov Upholstery Supplies. Talk about upholstery galore! Originally springs, cotton, and horsehair were used in place of upholstery foam. 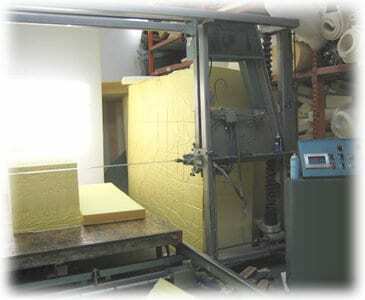 From about the 1930s, upholstery foam was a natural latex-based (natural tree sap) upholstery foam called "pincore." In the 1960s, chemical polyurethane upholstery foam became the cushion norm. Chemical companies lobbied the California senate to require all upholstery components to pass flammability standards, and toxic flame retardant additives such as PBDEs were added to upholstery foam. In 2005 PBDEs were outlawed, due to their link to breast cancer. Now most foam companies don't use those chemicals in upholstery or upholstery foam. Our company roots are in upholstery foam and upholstery supplies since 1960. Nearly all furniture sold retail around the world is made using our "C" grade of upholstery foam. This is because this foam feels good when you test it and it has a much lower cost than the premium grades. The problem is this grade will wear out under regular use rather quickly. Consumers are basically tricked by the comfort of the sofa and within a short time find they need new upholstery foam cushions. Most upholstery foam sheets and custom cuts may be returned less a 25% restock fee. See our short contract terms during the checkout process. Have not used the 2" and 1" yet, but the 3" was easy to work with and is very comfortable. Sourcing high quality foam for sofa cushions can be challenging. FoamOrder provided a high quality product with good customer service. While they were not inexpensive, their product was fantastic. The foam that was cut for me was exactly how I ordered it. I'm very happy with the products I ordered and I just hope that the foam lasts as long as described.